~AUTUMN FAYRE~. STAFFORDSHIRE DOUBLE EGG CUP. Lovely bright patterned Staffordshire Potteries egg cup and plate showing farmyard buildings, animals and tractors around the edge of the plate and chickens on the egg cup. Great for your little (or big) person’s boiled egg and soldiers. Staffordshire Potteries Ltd Egg Cup - Irish Meadow - made in England.
' ELIZABETHAN '. RUPERT THE BEAR. FINE BONE CHINA. Staffordshire/Cornishware/Chefware blue and white stripe egg cup in great condition. Been stored in a cabinet rather than being a working piece. No chips etc. Please see other listings. Staffordshire Cornishware Chef Ware Blue White Striped Egg Cup 1960s 1970s . Good used condition no chips or cracks Dispatched with Hermes Tracked. This cup is 4" tall and the larger opening is 2 3/8" and the smaller one is 1 3/4". 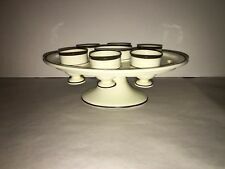 Up for auction we have this Staffordshire Creamware Egg Cup Stand complete with cups. In very good condition with just one cup having two hairlines and a foot chip. Then the stand having a small chip on one of the slots. It measures 7 1/4” by 9” by 3 1/4” tall and dates circa 1820’s. Very clean condition for a piece this early and delicate. Please view my pictures for further condition and feel free to ask me any questions. Satisfaction guaranteed. One of a limited edition of just 1500 made. In used condition but very good. Not boxed. See photographs for details of any areas of wear etc. Lovely thing, see photos for details. Barratts of Staffordshire Breakfast Set of plate, bowl, mug and egg cup Michael Parkinson's "Woofits" characters 1980's Superb condition, no damage or wear. Churchill Nocturne Catering Egg Cup x 2 . The egg cups measures 1 3/4"" in diameter and 2" high. They are in excellent condition with no chips, cracks or utensil marks. Thank you for looking. Six Royal Staffordshire Wilkinson Ltd Art Deco Floral Design Egg Cups. One careful owner from new. In a blue fluted design. Gorgeous 8 piece pottery/china set comprising of 2x plates 2x egg cups 2x bowls and 2 mugs all with cockerel design. The China is German made and in excellent condition apart from a mark to one of the mugs (see last picture) inside. It is not a crack and does not go through to the other side. Broadhurst And Sons Kathie Winkle Corinth eggcups egg cups x 4. Dispatched with Royal Mail 2nd Class. THIS IS A LOVELY POTTERY SET. Un-Branded Traditional Blue Tray of 4 Egg Cups"
DERBY POSIES. This beautifully designed egg cup from Royal Crown Derby is in the pattern. Brand new still in original box never took out till today Woofits Bowl Plate And Egg Cup. Condition is New. Dispatched with Royal Mail 2nd Class. Collectable Carlton Ware Egg Cup from 1980's. Designed by Fluck and Law as part of a collection of novelty ceramics based on caricatures from the 'Spitting Image' TV Series. This item features 'Fergie' (Sarah Ferguson) and is in excellent condition. 6 earthenware Biltons egg cups set made in England in immaculate conditions. Late 19th century Staffordshire delft style Ironstone double egg cups. These cups are in good antique condition with no chips or cracks, but do exhibit some crazing and staining. The cups are Marked “ENGLAND”. Dimensions: 3 1/2” tall with a top diameter of 2 1/2” and a bottom diameter of 2”. Dibbern, Solid Color, Color: Cornflower,noble egg cup on foot. Marke Dibbern. Form & Funktion Eierbecher auf Fuss.